Ripley’s Moving Theatre, located at the top of Clifton Hill is a an exciting experience for the visitors of Niagara. 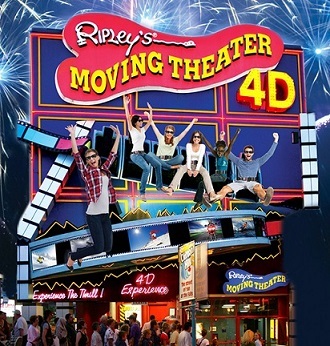 Experience the thrill of Ripley's Moving Theater, the only movie of its kind, where you actually move with the picture and feel every bump, dip and turn. The Moving Theater has a height restriction of no less than 43” and those who suffer from motion sickness, seizures, back/neck/head injuries or are pregnant are strongly advised not to ride Ripley’s Moving Theater. The dynamic 6 channel surround sound system and giant 70mm screen thrust you into the picture. Fun for the whole family.